The Days Inn Crystal River is conveniently located off of US 19 offering immediate access to Crystal River. It has 107 rooms and is a two story hotel. Tampa International Airport is approximately 90 minutes away. Local Taxi Available. Boat ramp and overnight dockage available - Charge per Slip Per Night. Dennys Restaurant on site - open 24 hours. Free HBO and Disney channels. In Room Coffee, Iron and Ironing Boards in every room. All Rooms have Micro/Fridge. There is no charge. Free Wireless High Speed Internet access at Property. Fax/Copy service-charge applies. 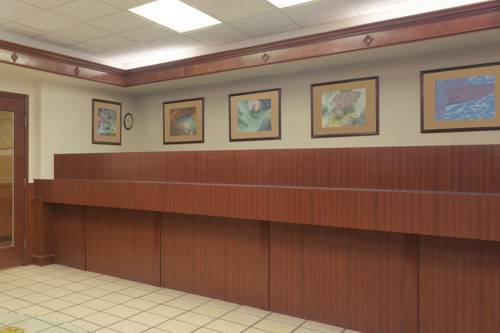 Free newspapers, 24 hour desk service and guest laundry facilities available for your convenience. Outdoor Pool with kids play set next to the pool at property. Our Days Inn has a variety of room types that offer two double beds, one king and Suite room with king bed and sofa bed. Pets allowed for a charge per pet per night. Inshore and Offshore charter fishing by reservation - call 352-795-7033 PADI 5 Star Dive Resort and full service dive shop offering guided dives and all levels of training. For reservations call - 352-795-7033. Boat rentals, bait tackle, and manatee gift shop on site. Marina store offering - ice, snacks, t-shirts, and picnic/boating supplies. Daily Manatee Eco tours at 7:30 and 11:30 am. ~35 miles from Crystal River. ~67 miles from Crystal River. ~58 miles from Crystal River.